​Come see our cozy and warm toddler house that feels like home, and our spacious well-equipped preschool building! And now, our engaging professionally designed and landscaped playscape is open for play and exploration. Full-day program hours are 7:00 a.m. til 5:45 p.m.
We also offer a half-day preschool from 8:30 a.m. til 12:30 p.m.
Summer Camp: Preschoolers through rising first-graders can enjoy our outstanding program all summer long, run by our regular degreed teaching staff! Sign up for one, two, three, or all four of our two-week camp sessions. 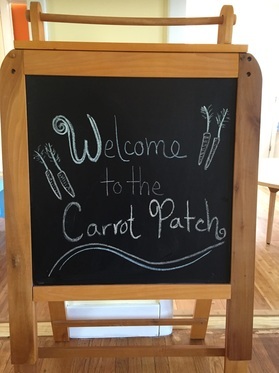 The Carrot Patch-Shoreline provides an individualized inquiry-based program, learning through play. We offer a carefully crafted curriculum centered around children's familiar environment with an emphasis on the natural world, and designed to challenge and inspire each child to stretch and grow. A typical day includes art, music, movement, literacy, math, and social-emotional content, as well as science--and plenty of time spent out of doors. Frequent walking field trips are planned to explore our diverse community. Staff provide a children's yoga practice. A children's librarian from the Clinton Library visits for monthly story time. Preschoolers received professional Spanish language instruction. Our professional staff tailors our program to the individual needs of each child, ensuring that the particular challenges they encounter ultimately lead to success. This experience of positive outcomes rewarding their efforts enhances children's self-confidence and naturally promotes a joy for learning! Every member of our staff holds a Bachelor's or Master's Degree in Education or Child Development and brings considerable classroom experience to the Carrot Patch. Be sure to check out the "Shoreline Staff" tab to read the bios of our impressive teachers! Our outdoor play space has been transformed with the help of a local landscape architect. Adding to the open teepee, tree platform, raised organic garden beds, and stump circle, we now offer a seashore-themed sand dig and river adventure with canoe, mud kitchen, sensory garden and dry riverbed with country bridge! Shoreline students enjoy frequent fun and educational nature walks around our neighborhood. We are within easy reach of woods, meadows, marshes and the town marina! Get in Touch/Stay in Touch! Feel free to send a contact form to join our email list and be notified of Open House dates and other developments, or to arrange an individual tour.